Guy Greenstone (left) and Steve Jeffares .. co-founders of the event. 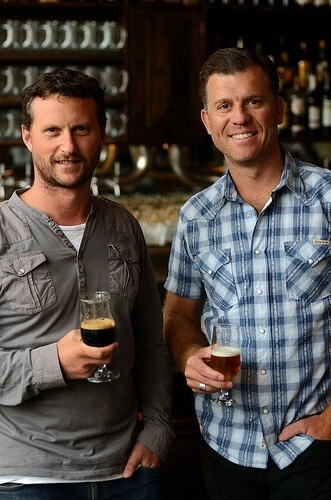 The event, brewed up by Aussie mates Steve Jeffares and Guy Greenstone, who own multi-award winning specialty beer venues The Local Taphouse bars in Darlinghurst and St Kilda, have seen such success in Melbourne they’re going to host events in both Melbourne and Sydney this year. Held at Melbourne’s historic Royal Exhibition Building for the last three years, it is seen as the premier beer and food experience in the country, especially for brewers wanting to push the boundaries. In total, more than 250 beers from 130 breweries were showcased along with gourmet street food, a fromagerie, live entertainment, brewery and industry stands and free educational seminars. This year will see more than 300 beers from 150 Australian and international breweries showcased, including 120 brewed specifically for the events in Melbourne, and Sydney’s event at the Australian Technology Park in Eveleigh. Warning this is a beer event! Dont worry there is will be some great cider there as well. Steve Jeffares says there’s no limit to what breweries can create. Steve says one of the biggest changes this year will be placing a greater emphasis on food. Acclaimed local brewers including Murray’s, Thirsty Crow, Riverside, 4 Pines and Young Henry’s will be among the many local, Australian and international breweries exhibiting. 4 Pines (who make a cider under a different label) brewer Leigh Smith says they wanted to create something as natural as possible so are using a technique of steeping roasted nuts and then freezing the mixture, so they can scrape off the fat, leaving “just the peanut goodness”. Leigh says GABS is a great way to give the industry a chance to really push the boundaries and get creative. “Providing beer lovers with lots of choice keeps brewers on their toes. As consumers get better educated, the quality of beer can only go up because if you drop the ball your sales will suffer and there will be no place for you in a quality driven market. It makes me as a brewer want to lead the market and raise the bar on a daily basis, but also as a consumer it means lots of great beer to choose from, which is only a good thing. The Great Australasian Beer SpecTAPular in Sydney will be a one-day event on Saturday 30th May at the Australian Technology Park in Eveleigh.